This is a follow-up post on how to enable YouTube safety mode on your computer. Well, I discovered from that post that I wasn’t the last person on Earth to know about it. Do you mind if I consider that a sign that there may be hope for my non-tech savvy self after all? When I was learning how to set up safety mode on my computer, I came across one sentence that said it was available for mobile and with the YouTube app. I tucked that information away because it seemed like everybody said it wasn’t available. But I didn’t do anything with the information because I didn’t have a mobile phone at that time. I’ve received a few questions about how to enable YouTube safety mode on a mobile. So with the help of a couple readers (you rock! ), we may have figured it out completely. Select Safe Search and change it to the setting you desire. One reader pointed out that she could not lock the Safe Search option from there. She went into her Google account, went to Settings on the bottom right corner, and locked the safety mode from there. (Thank you, Sandi!) YouTube Safety Mode and Google SafeSearch are linked, so it makes sense that this would work. Now this is where I gently remind you that the YouTube safety mode is not 100 percent accurate so adult supervision is always the best way to keep your children safe while on the internet. I hope this helps! 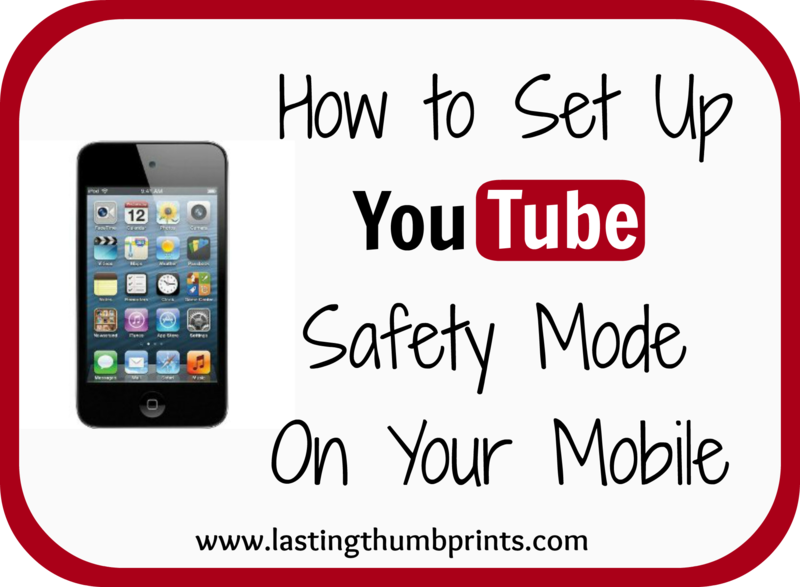 If you know of another way to set up safety mode on a mobile or the YouTube app, please share with us in the comments! I’m glad you wrote about this. I did it on BT’s iPhone also and since he didn’t have an app, it was exactly like you wrote, except the menu was on the left. I still think it is funny that my options were don’t filter and strict. It makes it sound like filtering is so bad. After hours or playing around with an Android, Samsung Galaxy s2 phone, this is how I was able to set youtube into safe search mode. First, go to youtube via your browser (you will need to do this for as many browsers as you have installed). You will also need to do this on the youtube app. Once in youtube log in with your gmail account. Now, use your GALAXY menu button located next to your home button). If you aren’t sure look at your phone’s owner’s manual. On that menu click on security settings and make sure that the “automatically save passwords choice” is unchecked). Next, click on the settings logo (looks like a gear and right next to your gmail log in name). Choose settings and go to safety mode and click on. Now, sign out of gamil account by clicking on gmail name the choice will appear to log out. NOW, go back to your Galaxy menu button and go into security. Scroll down to settings/security. From there click clear passwords. In this way the phone will not remember the password you just used for gmail. Now, test the system. I recommend testing the search bar while in safe mode with two key words and then testing it after you are logged on with the same two key words. Make sure that the screens look the same and are working. You may get some questionable videos on the screen but hopefully, when you click into it they will now allow you to play them. Keep in mind that youtube’s idea of safe search is probably not ideal but far better than nothing. Now, try to log in again and make sure that it doesn’t automatically log you in with a saved password. I also recommend trying this out from time-to-time and make sure that it is working. As a rule I have my kids plug their gadgets into my room at bedtime so that they can rest. This gives you an opportunity to look things over from time-to-time. I have discovered glitches so keep trying. I tried the same thing on the youtube app for the Ipad and it does not work. In that case I recommend not allowing the app and only using the internet but that is a whole other topic. First try testing the system with two key words such as s- – and p – – n while in the unsafe mode. Second, lock into safe mode and then test out the same two key words and see what appears. Third, log out of system after locking into safe mode and test the same two key words. It isn’t fun but click on any questionable video and see if it allow you to play. Often in safe mode it will still show the video choice but not allow you to play it once you click on it. This is GOOD! Fourth, trying logging in with a different gmail account. If it is working right it will allow you to log in but should secretly be working in safe mode in the background. Test to make sure it is. Also, try changing the settings while logged in under another account. Even though it allows you to turn off safe settings it SHOULD still be working in safe mode as you locked it in that way for the browser and then logged out. You can never assume that something is working for good you must test from time to time even though it is not fun! I cannot find the security settings option when using menu button on a galaxy tab. There is a settings option but this does not have a safety mode option.